Polly Cohen & Julius Henry Goldwater were married on 26th December, 1929 at West Ham District Synagogue, Earlhamgrove, Forest Gate. The couple settled in Cambridge and Julius, originally from Edgbaston, Birmingham, ran ladies and menswear shops. They had two children, Clive & Marlene. 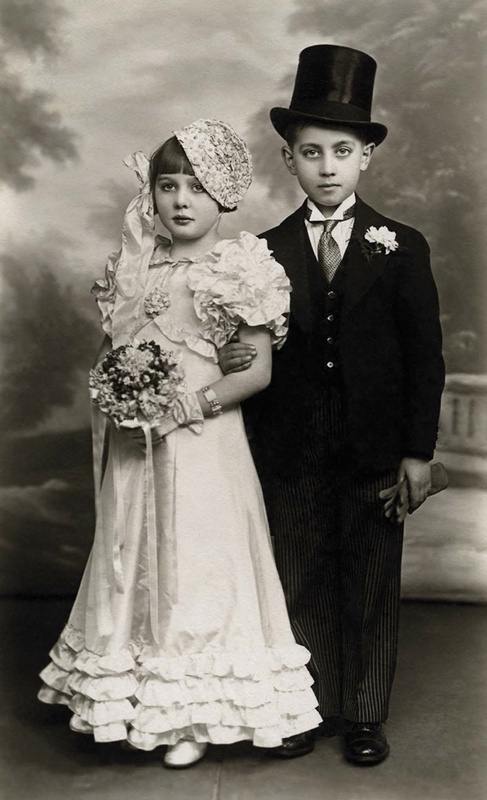 Dora Sweetman & Isaac Feierstein were married on 15th June, 1930 at Fieldgate St Great Synagogue, Stepney. Isaac, born in Warsaw, was a master tailor with a workshop in Stoke Newington and Dora was a tailoress. 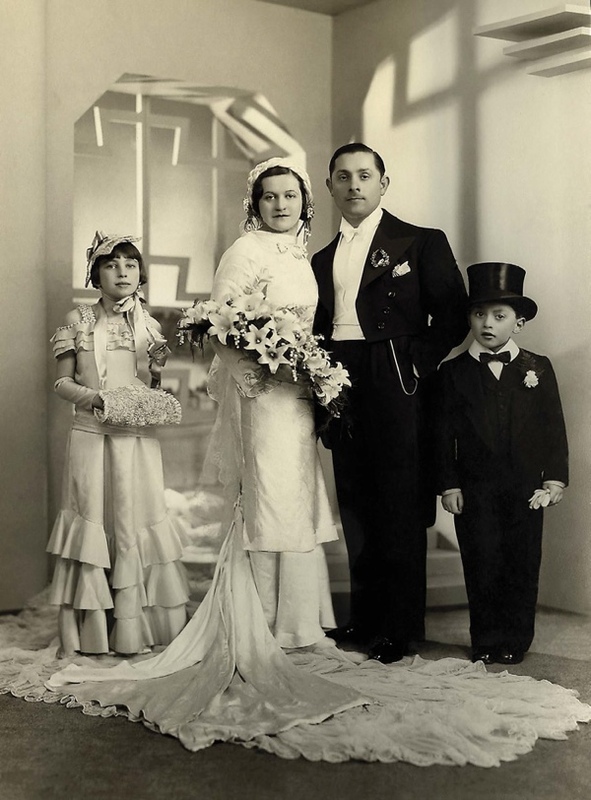 Elsie Pliskin & Victor Pliskin were first cousins aged nine and six at the wedding of their cousin Minnie Pliskin, a milliner, and Barnett Cooklin, a cabinetmaker, on 11th December, 1932 at Jubilee St Great Synagogue. Victor’s winged collar was specially made by the outfitters, Mays in Whitechapel Road, next door to the Blind Beggar pub. Victor later married Irene Plisken on 11th August, 1946 in the Dunstan Rd Synagogue, Golders Green with the reception at the Regal Ballrooms, Finchley Rd. Victor was a machinist at a London tailor but was evacuated to Luton during World War II. Later he set up his own ladies’ tailoring business called ‘Renvic Modes’ and Irene became a hairdresser like her father Reuben Plisken. 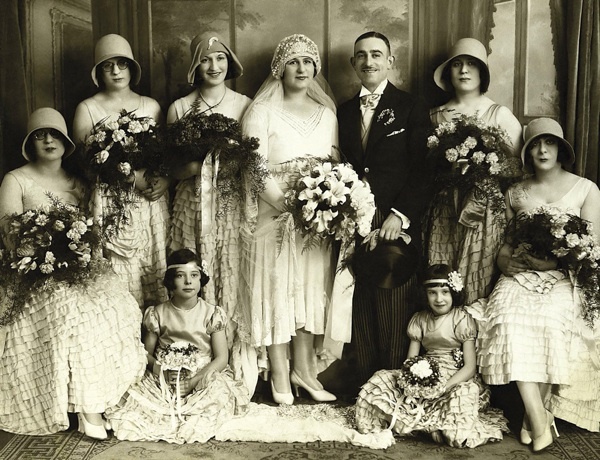 Dora Ackerman was a bridesmaid at the wedding of Aida Margolis & Hyman Lever in October 1931. Dora, a friend of Aida, was married in 1933 to Nathan Misner and had a daughter in 1936 and a son a year later. Both Dora and Nathan worked in the jewellery trade. During World War II, Nathan served in the Far East and Dora died prematurely in 1944, aged only thirty-six. 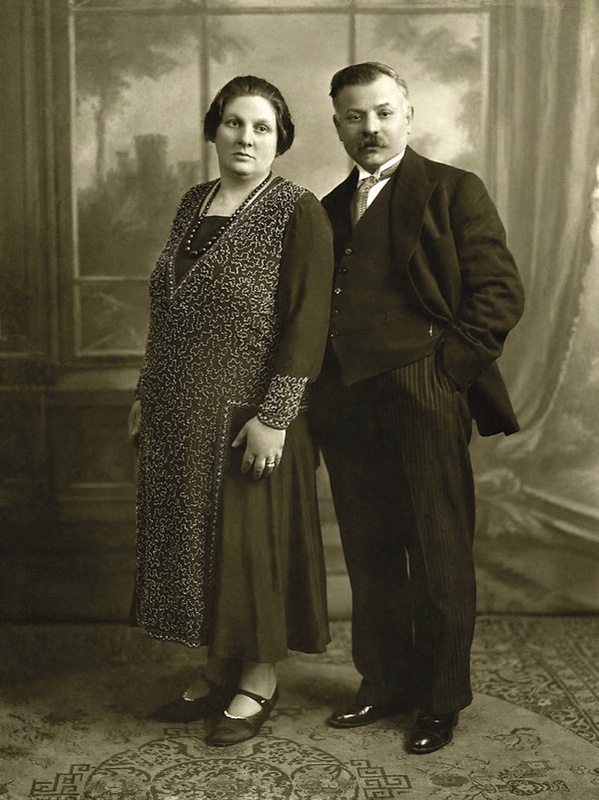 Fanny Borona (also known as Felice Flatto) was a shop assistant who married Morris Winter, a tailor’s cutter, on 1st May 1932 at the Great Synagogue, Dukes Place, in the City of London. Fanny died aged eighty-eight on 27th January, 1996 in Hove, after an unspecified accident. 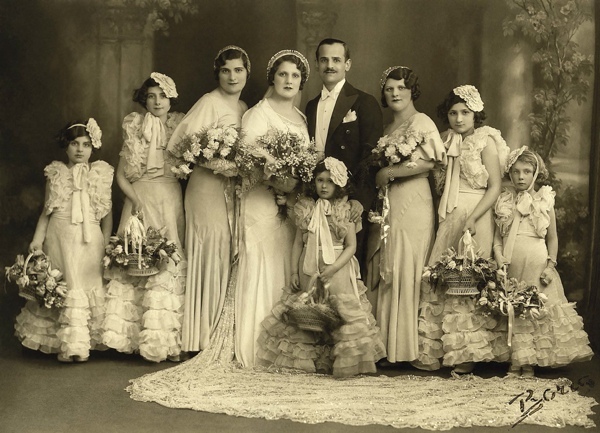 Eva Specter & Sanuel Goodstein were married on 30th March 1933 at Jubilee St Great Synagogue. The reception was held at La Boheme Ballrooms in Mile End Rd and was catered by M. Stern and Sons of Dalston with music provided by Leavey’s Oxford Orchestra. The bride’s parents were born and married in Russia and arrived in London in the early nineteen-hundreds, where Eva was born in Poplar in 1908. David’s parents were also born and married in Poland and arrived at the beginning of the century. Samuel was born in Mile End in 1906, he was an electrician by trade and Eva was a dressmaker, making all the dresses in the photograph herself. 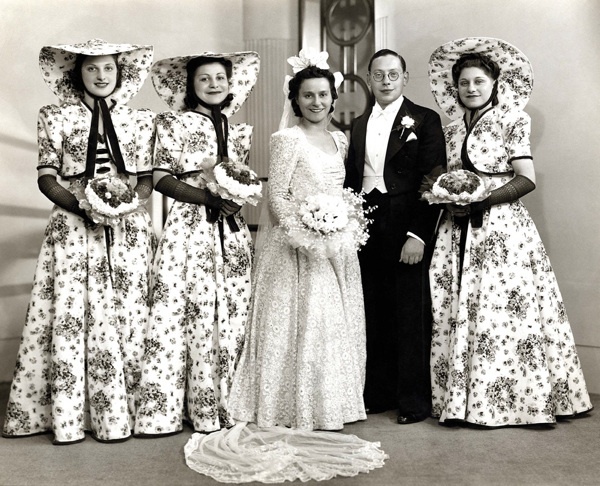 On the left of the bride is Gertrude Goodstein, Samuel’s sister, and to her left is Dinky, Eva’s cousin. To the right of Samuel is Rebecca Specter, Eva’s sister, and standing in front is Rene Specter, Eva’s niece. Fay Kaufman & Sidney Croup were married on 17th March, 1935 at Philpot St Synagogue, Whitechapel. Sidney, whose parents came from Lithuania, was a self-employed tailor like his brother Morris and Fay did the button-holes for suits made by her husband. The couple lived in Stepney and in 1960 moved to Ilford. The page boy was Sidney’s nephew, Roy Segal, while the bridesmaid is believed to be a cousin of Fay’s. Esther Davidson & Kurt Keyem were married on 22nd June, 1939 at the Beth Hamedrash Synagogue, Stamford Hill. Kurt, born in 1914, was director of a chemical company, his father Jacob was an upholsterer and Esther, born in 1906, was a tailor’s manageress. Esther had a brother, Alec Davidson,who married Eva Yanovitch in 1943, and four sisters Annie, Yetta, Bella and Dolly. 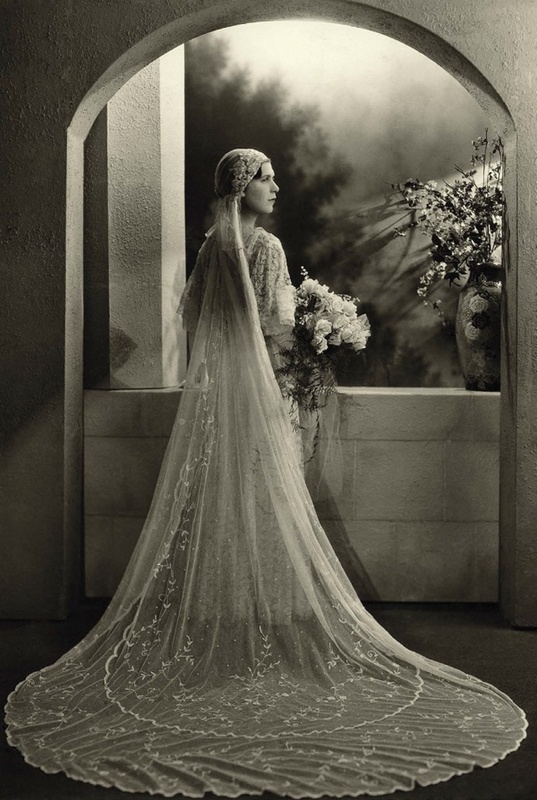 The wedding hats were made by Bella, a milliner, and the dresses by Bella’s mother Betsy. Annie & Isaac Abraham Severin were photographed c. 1931. Isaac was a furrier and both were born in Poland in 1884. Isaac died in 1953 and Annie two years later. They are both are buried in Edmonton Cemetery. 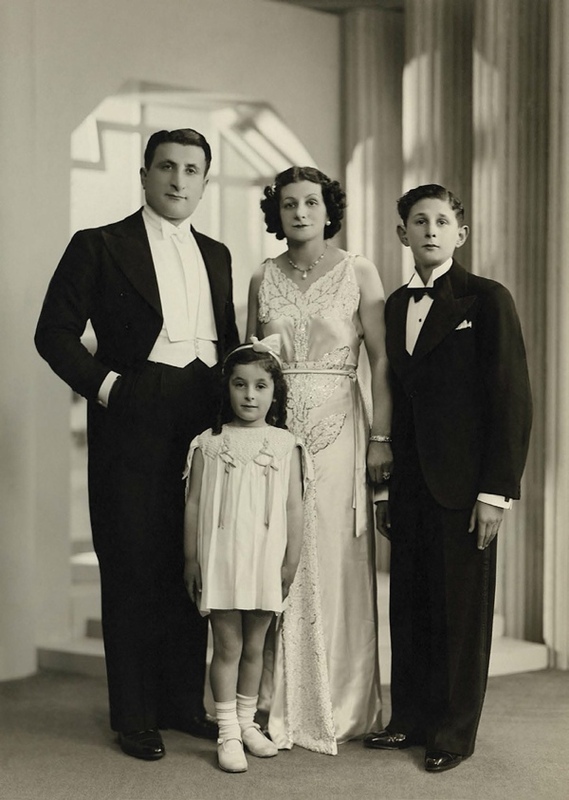 Monty Hubbersgilt was photographed at his Bar Mitzvah in April 1938 with his sister Sylvia and his parents, Alec & Rachel. At the time, the family lived at Wellington Ave, Stamford Hill and Monty attended Tottenham Grammar School. The Hubbersgilts came to London in 1901 from Vitebsk in Lithuania. Alec was brought over nine years later by his aunt. His family of eleven children (eight boys and three girls) lived in Brick Lane above his workshop and all the boys were trained as cabinet makers. Alec was educated at the Jewish Free School but left at fourteen to work with his father. He married Rachel on 17th June 1924 at Philpot St Synagogue. 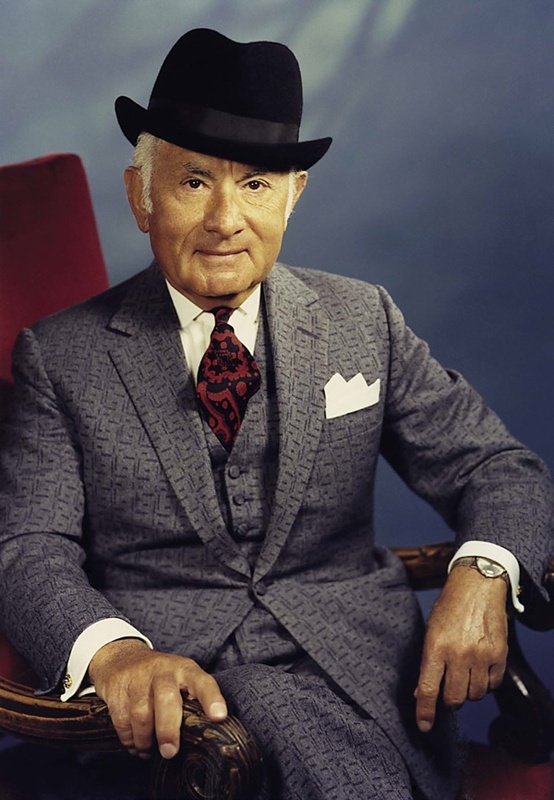 By the time of Monty’s Bar Mitzvah, Alec owned his own factory in Stamford Hill, employing around fifty people, specialising in the manufacture of cocktail cabinets and dining room furniture. Monty’s mother Rachel had also come to London from Vitebsk in the early nineteen-hundreds with her family (ten girls and one boy) and lived in Customs House, Docklands. Not wanting to stay at home, she trained to be a shorthand typist. 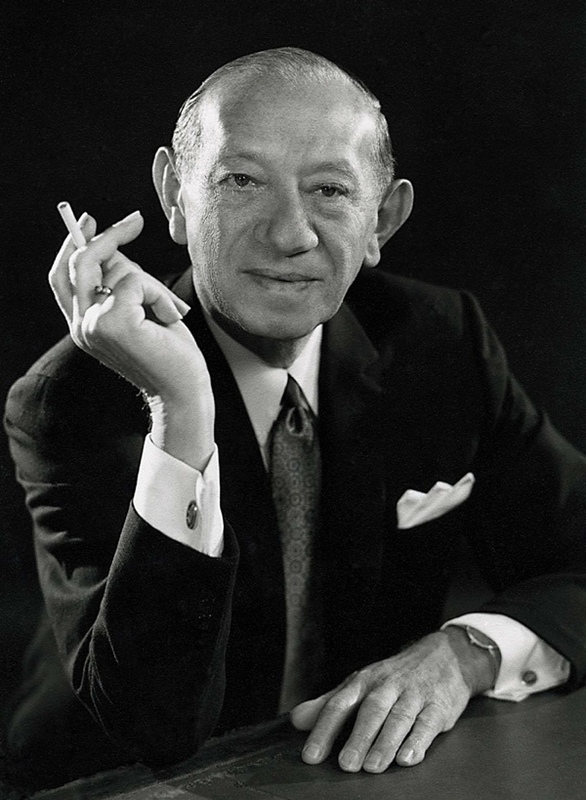 Sir John Edward Cohen, known as Jack Cohen, was born in 1898 in Whitechapel, the son of a Polish tailor. In 1917, he joined the Royal Flying Corps, serving as a canvas maker. In 1919, using thirty pounds of his demobilisation gratuity, he set himself up as a market trader in Hackney selling surplus NAAFI food. With his fast turnover and low prices, Jack earned himself the nickname ‘Jack the Slasher’. He soon owned a number of stalls and started a wholesale business. In 1924, the same year Jack married Cissie Fox, he created the Tesco brand name from the initials of a tea supplier, T. E. Stockwell, and the first two letters of his surname. The first Tesco store opened in 1931 and, over the next eight years, the company grew rapidly, opening more than a hundred small stores mainly in the London area. In 1935, Jack visited the United States but his dream of setting up American-style supermarkets was halted by World War II. In 1948, the first self-service store opened in St Albans and, over the next twenty years, Tesco expanded quickly across the country, mainly by the acquisition of smaller grocery chains. In 1969, Jack was knighted and retired from the business in 1973, by which time Tesco operated nearly nine hundred supermarkets. Jack & Cissie had two daughters, Shirley & Irene. Jack died in 1979. Wonderful portraits. I really love this book. i wonder how many of Boris’ photographs were kept. I am trying to track down my parents and grandparents wedding photographs. What an evocation of another time. Superb photography, arrangement, lighting, and composition. I have family photographs from the same era, few if any match the quality here. Thank you. Thank you so much for sharing these wonderful images, which tell so many stories. I admire the way many of the photographs are styled, with the glamourous Art Deco shapes in the backgrounds and the shadows they cast. I am looking for information about a man I worked for in the 1970s – Lolly King. His father was Ralph King, and they had a chain of small leather goods shops, and also stalls in various markets, including Norwich. Lolly was a great inspiration to me, and was very kind. Mrs King, his mother, had her hair cut at Vidal Sassoon and always wore shaded of brown and cream. I think they eventually lived in Golders Green. Any information gratefully received. sbw. quality photos indeed and such an evocation of Jewish life and hopes in the 30s. 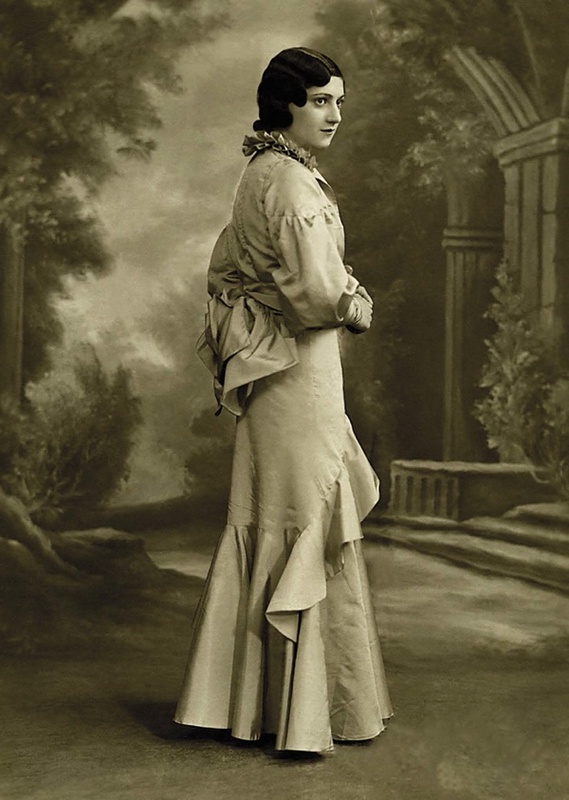 Photo’s of such style and posture of those involved, they are magical to look at – it would be difficult to find equal kill in the making of wedding photography today, very stylish indeed. As an American of English-Jewish descent. your stories of Jewish life in the East End, give me a glimpse of a life I know nothing about. My grandfather, a tailor, came here after serving in the RAF in WWI, as a tailor repairing the canvas wings of the biplanes. He died in 1928 due to an infection from an appendix operation, so the english part of his life is a mystery. My grandmother, an awful woman, remembered very little and subsequently married 2 more times. Thank you and I do cherish these stories. really enjoyed seeing these superb photographs. Jack Cohen would be both proud and sad at what’s happening to Tesco just now. I have several lovely photos taken by Boris – of the weddings of two of my aunts and that of my parents. Beautiful. Having just purchased the Boris book it has given a wonderful focused insight into the era that my parents were part of. One cannot but wonder the lives these people lived. Looking closely at their faces one poses so many unanswered questions. The elaborate costumes was a statement of how they wished to be seen. The cost during those war years must have been for many a huge sacrifice. The book is to my mind a major statement about a jewish era now completely vanished, a true testament. Both my parents were from Ireland but lived in the East End. 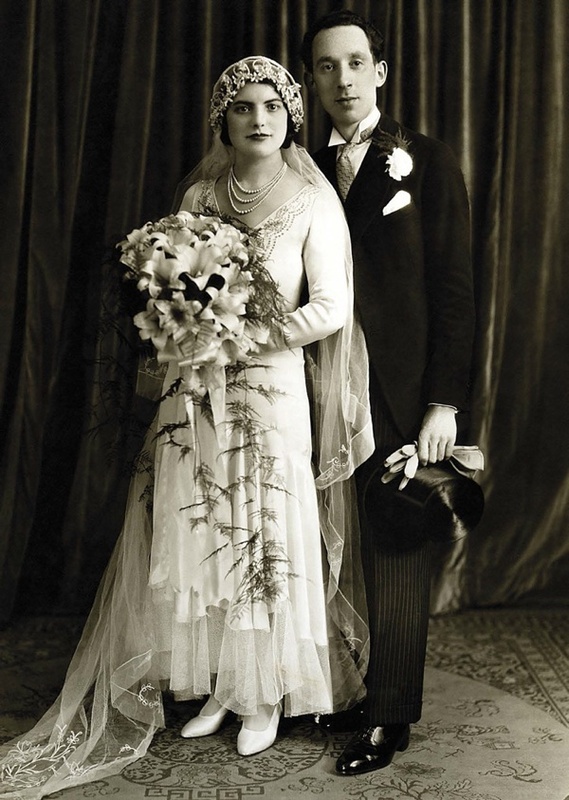 They had their wedding photos taken in Boris’ studio in 1939/40. Several of my mum’s many sisters and their husbands also had their wedding photos taken there. I have a beautiful wedding photo of my parents in a gorgeous Art Deco frame on display. So many friends have seen it and think it is of Hollywood stars of the time. My parents, Catherine and Arnold Kendal (Kitty and Jock) were photographed by Boris with the very familiar backdrop and when visiting friends of ours in Toronto, her parents and Aunt and Uncle were displayed with the same scene, so very special. However, I don’t see these pictures on line, but I wonder if they are in this book. It would be wonderful to see them, even though I do have their Wedding photograph, which I discovered after they passed away! My mother had a feather in her hat and didn’t like it and would never show me the photo! I think they were married in 1942 – October 27th. Can you tell me where to purchase this book, the next time I’m in London, I would like to but it? Laws by boris from the 40s.